ASTHO, with its Million Hearts State Learning Collaborative, supported the efforts of 26 states, the District of Columbia, the U.S. Virgin Islands, Guam, the Commonwealth of the Northern Mariana Islands, and the Republic of Palau to help save lives by preventing heart attacks and strokes through blood pressure control. The states include: Alabama, Alaska, Arkansas, Colorado, Connecticut, Florida, Georgia, Illinois, Indiana, Kansas, Maryland, Michigan, Minnesota, Mississippi, Nevada, New Hampshire, New York, North Dakota, Ohio, Oklahoma, South Carolina, Texas, Utah, Vermont, Virginia, and Wisconsin. This brochure describes the collaborative engagement across three high-value partners, ASTHO, YMCA of USA (Y), and NACHC, to accelerate the use of self-measured blood pressure (SMBP). The work described in the brochure not only outlines how state, local, and community partners increased the use of SMBP for those with hypertension, but it further defines how clinical-community linkages can impact chronic disease. The objectives of this national collaboration with state and local public health agencies and YMCAs were to increase patient use of SMBP, design and test 2-3 integrated SMBP models that mitigate barriers, amplify facilitators, prioritize the most important actions to take in each jurisdiction to accelerate SMBP, and capture return on investment in order to influence policy and reimbursement models. This work was done in conjunction with a pilot project in three states. For more information on state-level findings, access the related fact sheets. An inter-related framework for systems in a state that support hypertension identification, management, and control. 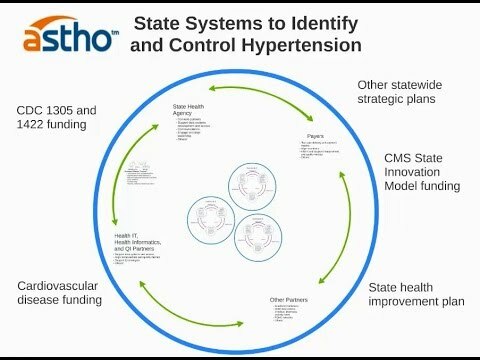 The below illustration aims to contextualize the roles of a diverse range of state and local-level partners involved in each state’s project, as well as the different settings and partners within a community that are involved in creating systems of care for hypertension identification and control.